Become a fan of How Sweet It Is on Facebook! Saturday night, I had an intense craving for chocolate. There wasn’t anything special about this, because I usually am craving chocolate 23 out of 24 hours each day. I even crave it when I sleep. I dream about it. I would marry it if I could. This craving was different. I wanted something rich. Something so chocolatey that I couldn’t see straight. I didn’t want a cookie. I didn’t even want a brownie. So after reading the reviews for this chocolate loaf from Nigella, I decided it would fit the bill. It was super easy – all of the ingredients just went into a food processor! I knew the cake would be tasty with the addition of sour cream. I love sour cream in my baked goods – it makes them so moist. The batter was a smooth, thick, chocolate mess. Thicker than brownie batter and fabulous tasting. I was satisfied just by eating the batter. And the final product? Just perfect. Preheat the oven to 325 degrees F, putting in a baking sheet as you do so. Put the flour, baking soda, cocoa, sugar, butter, eggs, vanilla, and sour cream into the processor and blitz until a smooth, satiny brown batter. Scrape down with a rubber spatula and process again while pouring the boiling water down the funnel. Switch it off, then remove the lid and the well-scraped double-bladed knife and, still using your rubber spatula, stir in the chocolate chips or morsels. Scrape and pour the batter into the prepared loaf tin and put into the oven, cooking for about 1 hour. When ready, the loaf will be risen and split down the middle and a cake-tester will pretty well come out clean. I skipped the chocolate sauce included in the recipe, opting for something more sinful. Sure, I was craving chocolate, but I thought a Bailey’s glaze would top the cake off perfectly. Mix both ingredients in a mixer, adding more or less sugar depending on desired consistency. Then I did it with about 4 more slices that same evening. The cake, not the drink. Well, OK – the drink, too. 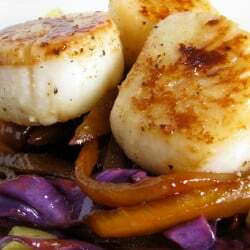 Seared Scallops with Carmelized Mango Slaw. You know something’s wrong with you when even the sight of the ingredients in the food processor makes your mouth water. This looks absolutely delicious! And the Bailey’s glaze–genius. Everything is better with Bailey’s! That chocolate cake looks amazing!!! I’ll have to come back to this recipe next time I have a super strong craving for something chocolate!! MMMM that looks good. As a fellow chocolate lover, I will have to try that soon! I think it’s so funny that your hubby says he doesn’t like things, but has probably eaten them. lol. I crave chocolate all the time. I so understand! I love that you just whipped up a loaf of bread to satisfy the craving. It looks wonderful! Jess you sure do know how to make a girl crave chocolate in the a.m!! looks so delicious :) Really love that you don’t healthify your baking. Nigella’s recipes are always really fun to make because they’re simple and hard to screw up. I love her brownies… I think you use one pan!! This cake looks so delicious. I wonder what a good replacement for sour cream would be? I bet silken tofu would do a decent job! holyyyyy expletive. that looks unreal. and i don’t even love chocolate. well, perhaps if i had a man, things would change. maybe i’d fall in love with chocolate, depending on the lover in my life. fickle much? and i can make this in a FOOD PROCESSOR? aFREAKINmazing. i asked for and got a food processor for Christmas. I said i wanted to make hummus, other dips, and some other healthy junk. scrrrrrrrew that. at least i kept up the illusion for a little while, of cooking healthy things. Love that Irish Creme w/ my Chocolate!! Anything by Nigella would definitely fit a “rich, chocolatey craving”…the woman is downright decadent! I think your Bailey’s glaze sounds like a nice option! wow! this is making me drool! i can’t wait to make it! you had me had “Quadruple Chocolate”! Oh my god, now I’m going to be craving this all day. Do you think this would work as a standalone loaf, i.e without frosting? I LOVE reading your blog…it’s so much fun. Your husband sounds a lot like mine…very stubborn and ‘always’ right – lol. After giving this recipe a once-over I decided I would try it as I coincidentally have everything in the pantry for it! And, as snowed-in as I am at home today, it is smelling glorious in my kitchen right now as it bakes. Can’t wait for the result! Omg I want to make this when Aunt Flow pays me a visit! It would be the perfect coping mechanism, I think (considering the INSANE chocolate cravings I get when she’s around). Though I don’t have a loaf pan, I do have a bundt pan. Do you think this recipe will turn out just as good?